Heat oven to 400°F. 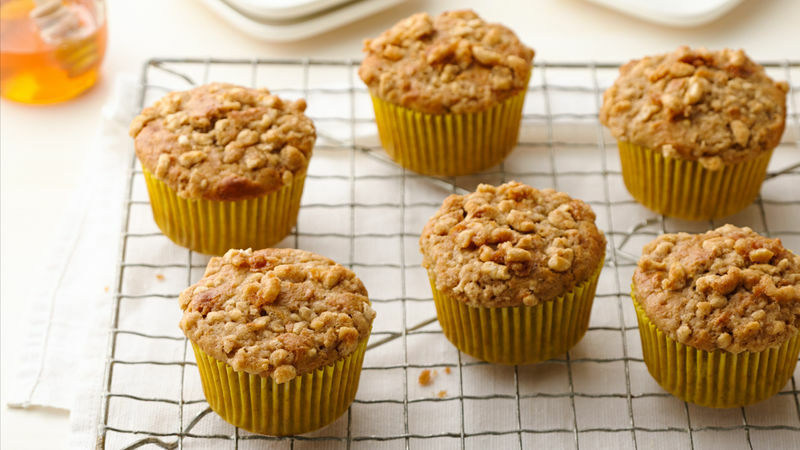 Place paper baking cup in each of 8 regular-size muffin cups, or spray bottoms only of muffin cups with cooking spray. Place 1 1/2 cups cereal in resealable food-storage plastic bag; seal bag. Using rolling pin, slightly crush cereal; set aside. In medium bowl, place muffin mix, milk and oil. Stir in egg and banana just until moistened (batter will be lumpy). Stir in crushed cereal. Divide batter evenly among muffin cups. Sprinkle streusel evenly over tops (about 1 teaspoonful each). Bake 14 to 19 minutes or until muffins are golden brown and tops spring back when touched lightly. Immediately remove from muffin cups. Cool 5 minutes before serving. Unlike most muffin mixes that tell you to fill the muffin cups two-thirds full, it's important to fill the cups in this recipe three-fourths full or almost full. If you don't, you'll wind up with leveled muffins! Add 1/4 cup miniature semisweet chocolate chips with the banana, if desired. Muffin mix, banana and Honey Nut Cheerios™ cereal partner in an easy crunchy-topped treat.